This picture displays St. Louis Cardinals Yadier Molina pumping his fist in triumph, not even a second after the final strikeout from Adam Wainwright, delivered to Brandon Inge of the Detroit Tigers. Shortstop David Eckstein watches the pitch in anticipation of winning the 2006 World Series. 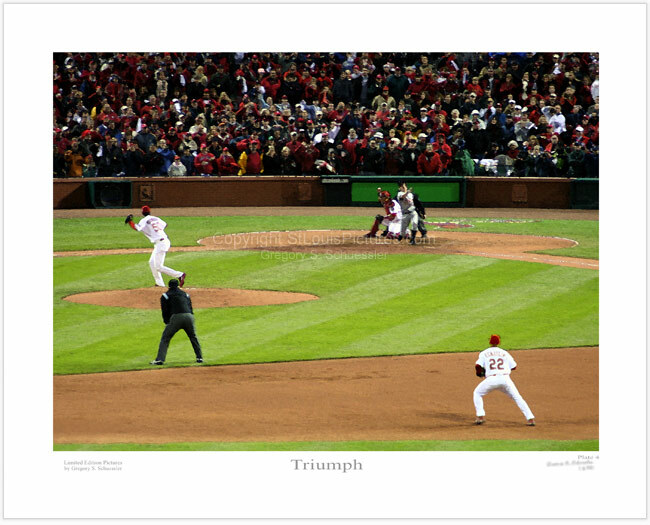 The Cardinals went on to win by a score of 4-2 on October 27, 2006. This picture is part of a four plate series. Plates 1 thru 3 show action from various areas of this full version depicted in plate 4. View plate 1, plate 2 and plate 3.